WHERE’S ROBERT BOCCABELLA WHEN YOU NEED HIM? Yesterday at Lauren’s school I looked for a piece of paper in the office so I could jot down a phone number. There was none to be had. I rifled through my purse so I could use the back of a receipt, then looked for a pen. The only pen available was tied to a short string and attached firmly to the counter. No one, including me, would be walking away with it. In Costa Rica there is very little waste. At school, Lauren’s classroom has a “materials monitor” in addition to the other tasks students take on. 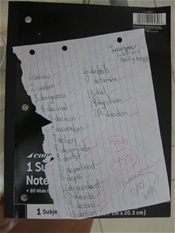 Spelling tests are done on half sheets of paper or the back of a used sheet. On our refrigerator, I’ve posted a list of items I’d like to bring here from the United States when we go back for a visit; among them: rubber bands, an item in abundance in every American junk drawer in every American kitchen. We don’t have any here. So why was I looking for Robert? His company, Business Design Services, generously passes out the coolest sparkling red pens and fabulous purse-sized notebooks. I should have stocked up when I had the chance - Robert probably would have given me a rubber band too. You mentioned "visiting" the United States...I'm glad you're enjoying yourselves, but please say you'll be back after 6 months?